Professor of Zoology, Yvonne Buckley, outlined the need for researchers working in the fields of ecology and technology to work to assess, protect and enhance our invaluable natural capital as she delivered her inaugural lecture at Trinity College Dublin (Wednesday, 23rd March 2016). The building blocks of our planet, the atmosphere, rocks, soils, living organisms and the services they provide to humanity provide the natural capital which underlies our wellbeing and lays the foundations to many of our industries. Only by understanding human-modified landscapes, the living organisms in them, and how we can continue to live well in the long-term as the ecosystems around us change profoundly, can we build a better, more sustainable future. And by working at the interface of ecology and technology, and by engaging with industry partners, researchers can hope to invent and develop innovative solutions to some of the greatest issues currently facing 21st Century humanity. 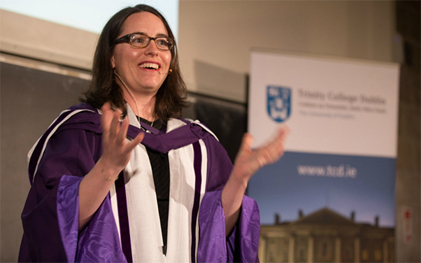 Professor Buckley was delighted to deliver her lecture in front of her friends, family and colleagues in Trinity.